Vineyard Children’s Center provides a nurturing, educational environment. Our skilled teachers will help your child learn and develop through both group play and adult interaction. We respect and value the differences in each child as to her or his interests, developmental needs and personality. We appreciate and value different family, cultural, racial and ethnic backgrounds. 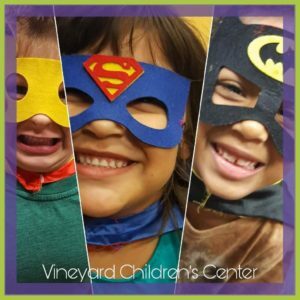 Our curriculum is based on the premise that children are naturally curious about their environment and that play is the essential ingredient of our preschool program. Through play in a well arranged and regularly enriched environment, children learn about themselves and their capabilities and develop their cognitive, social and emotional capacities. Teachers create a challenging environment in which information is available through a variety of materials. In the art area, children may have experiences with color, texture, shape, line and the expressive, creative quality of the materials. Building with blocks introduces the child to spatial, pre-math relationships such as balance and symmetry as well as promoting team effort and using a material to represent an idea. We provide many experiences that foster a love of reading and writing. Through exposure to good literature, “writing” activities, songs and finger plays we set the stage for later reading and writing. The dramatic play area offers opportunities to play adult roles and explore the magical world of fantasy and imagination. We utilize our outdoor playground and indoor multipurpose room to provide opportunities for large motor play. We provide experiences that foster a sense of self as a competent individual, an internalization of self-control, and a positive pattern of interaction with others. While nurturing and supporting each individual child, teachers also strive to encourage a sense of community and a sense of the importance of each child as a participating member of a group.We work to ensure a childhood experience filled with adventure, play, investigation and friendship.